It's actually enjoyable driving this early in the morning. You can't see anything except what is in front of the headlights and there are only a handful of other vehicles on the road at 5 am. I put on some good tunes and begin the hour and a half drive in search of a rare bird. 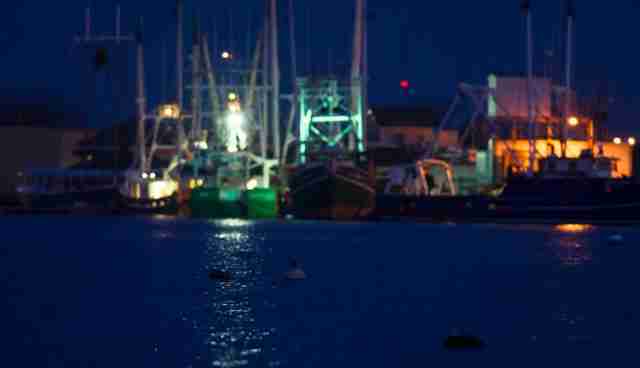 I miscalculate my timing and end up at the harbor in Cape May, New Jersey a solid half-hour before sunrise. I find the Nature Center where the bird I'm looking for has been reported and park the car. It's really dark out and I decide to wait in the car since it's about 30 degrees with a light breeze. 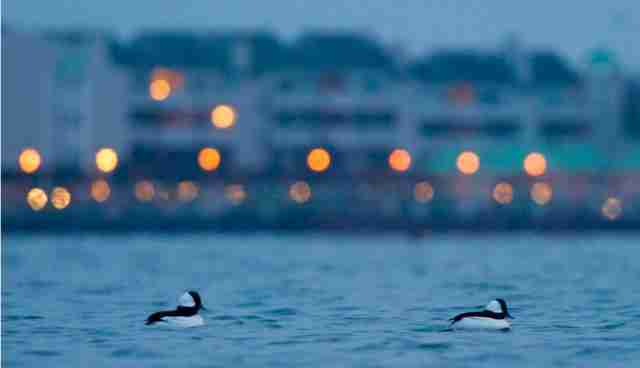 After about 10 minutes of waiting I start to see some small birds in the water as my eyes have adjusted to the darkness. 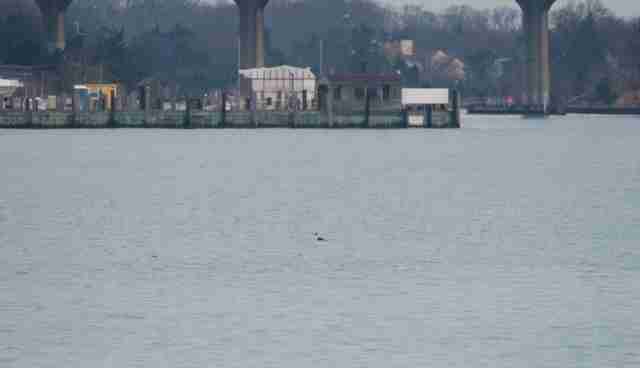 I put the car window down and pick up my binoculars and I can see there are a few Bufflehead ducks swimming around. That is all I need to grab the camera and head down to the shoreline. In the dark it's hard to see clearly where to place my feet as I climb down the large boulders to the small area of sand at the edge of the water, thankfully it is low tide. This allows me to get closer to the birds, get a better angle for photos and also somewhat hide myself among the rocks. 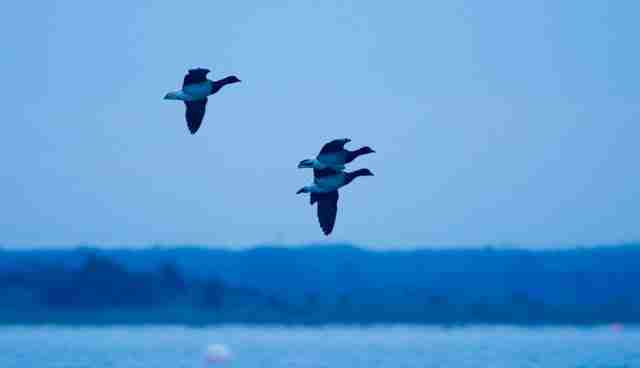 With all the movement of me climbing down, the ducks swim away. I get settled in to a comfortable spot and just try to hold still in the chilly morning wind. I decide to look through my camera to see what kind of settings I can get and notice that at 8000ISO I am able to get the shutter speed up to 1/30 sec. I think, "if I can brace myself and relax I might be able to make a sharp photo." I frame up a photo, relax my whole body, and squeeze off a series of photos. The photo posted above is one of those photos, it works! If I can brace myself and relax, I might be able to make a sharp photo. 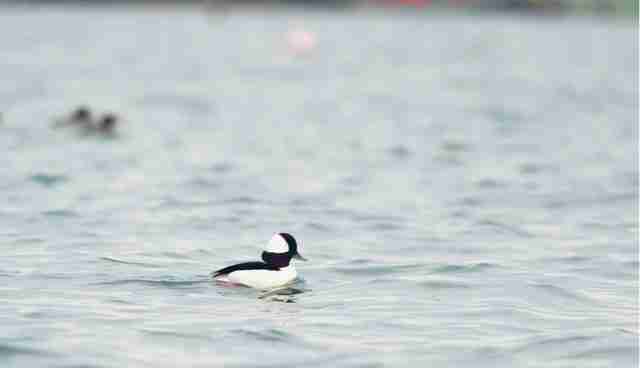 Not even 5 minutes after I climbed down to the shoreline I see a male Bufflehead coming closer to me. I know I won't be able to get a really sharp photo but take a few shots anyway to see what might happen. The photo below is an unexpected surprise, I catch one of the ducks right as he is diving and it makes for some really cool motion in the photo. The sun hasn't even come up and I'm already getting some interesting photos. I sit still for another 30 minutes, photographing whatever comes close enough and keeping my eyes out for the bird I am seeking. I've come to this specific spot in hopes of photographing a Western Grebe, a bird that is anything but common on our side of the country. 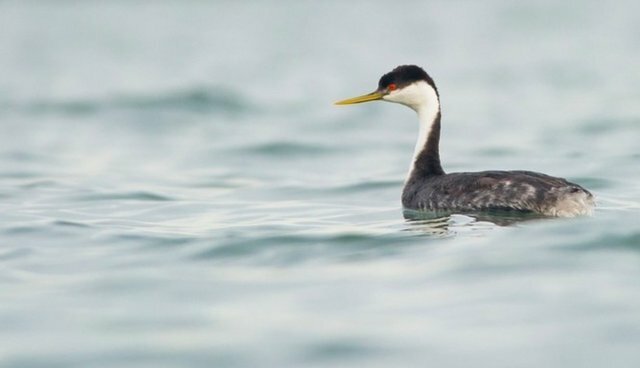 The Western Grebe's normal range consists of the west coast of the US and sometimes extending to the middle of the country. 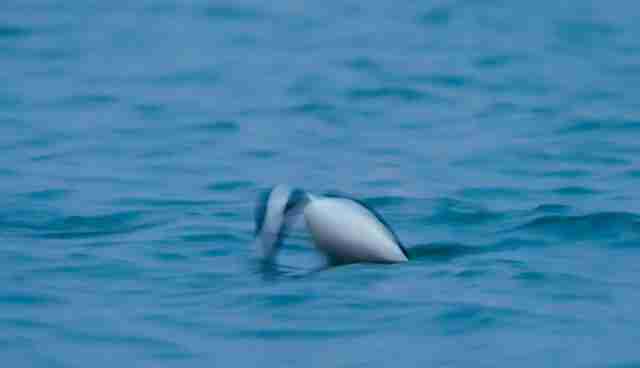 Sightings along the east coast of the US are quite rare. This bird is anything but common on our side of the country. My patience wears off finally and I climb up the rocky shore to the road and start walking along the edge of the harbor to see if I can find the Grebe. As I'm walking along I find a little piece of land that juts out into the water and I head out to get a better look. 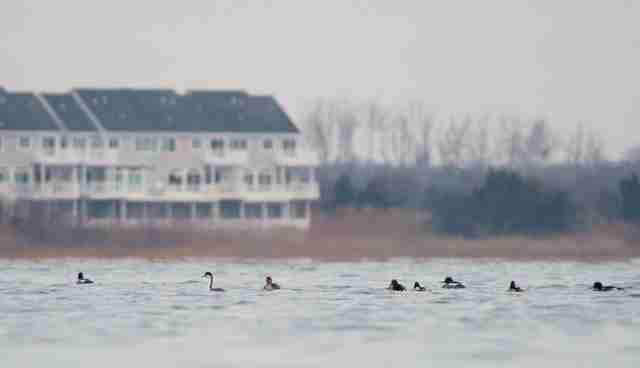 As I'm scanning the water with my binoculars I see a large group of ducks off in the distance. After a more thorough look I can see they are a small flock of Red-Breasted Mergansers, maybe I'll get lucky and they will come closer, the males are gorgeous. I'm just about ready to walk back and I see a single bird way out in the distance. Once again I put the binoculars to my eyes and I'm thrilled! 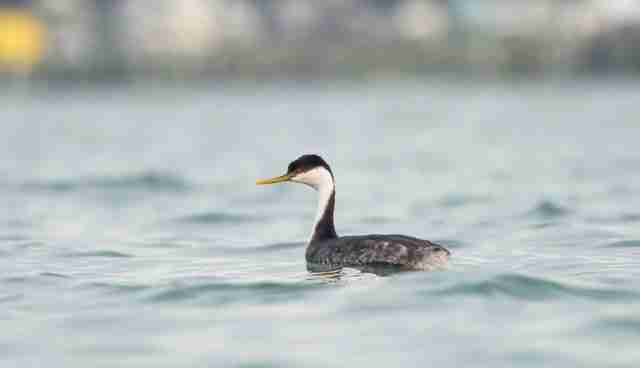 I can instantly tell by the shape, even though I've never seen it in person, that it's the Western Grebe. Not knowing where it will go I immediately take a photo just so I have something documenting my sighting. It's a tiny dot in the frame but you can still tell what it is. It's a tiny dot in the frame but you can still tell what it is. 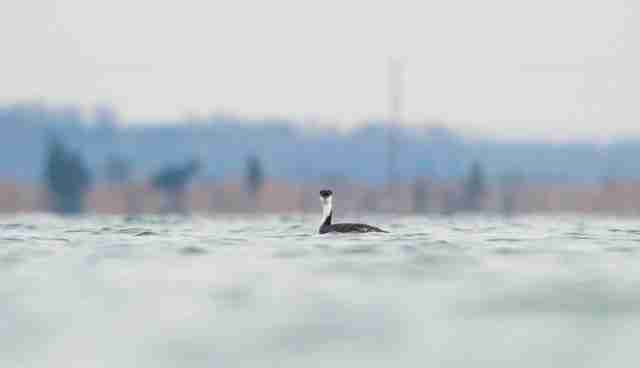 The Grebe starts swimming in my general direction and joins up with the group of Mergansers I saw a bit earlier. Slowly, very slowly, it keeps getting closer and closer as it swims along the harbor heading back to where I had started the morning. I attempt to predict where the bird is going to go and move ahead to that spot, each time climbing down to get near the water. I'm taking photos, lots of them, not knowing if the bird will come closer but hoping it will keep heading my way. When the Western Grebe finally stopped swimming it was directly in front of the Nature Center, exactly where it has been reported. The bird seems curious as to what I am and decides to come in for a closer look. 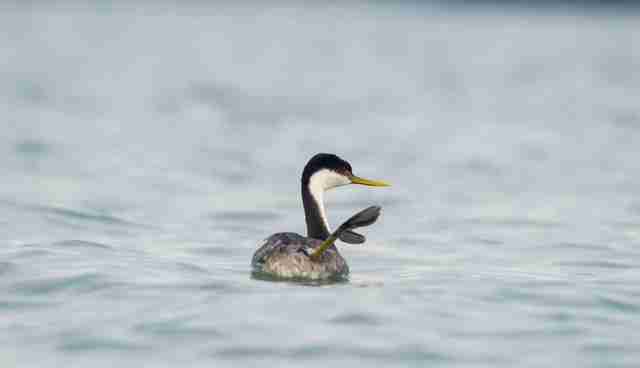 Only the head and neck are visible as the grebe's body drops between a set of waves. By now the tide is starting to come in and there is less and less beach for me to lay on by the minute. I finally have to lay/hold/bend over the rocks to stay near the water's edge but it is worth it since the Grebe is coming even closer. The bird seems curious as to what I am and decides to come in for a closer look. It keeps, what I'm sure it thinks is a safe distance from me, but comes close enough for some really great photos. I am so happy as I'm firing off photo after photo of the bird, I can't wait to see what I get! 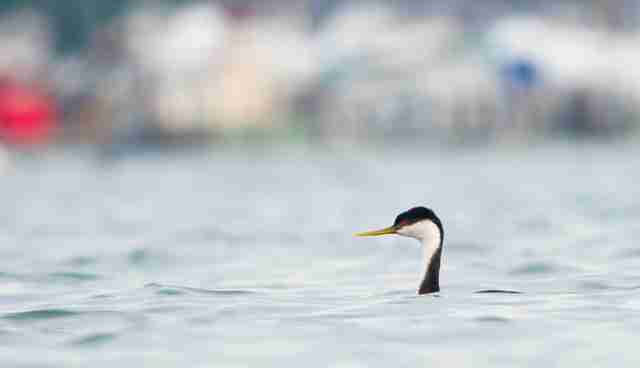 After about 15-20 minutes the Grebe has enough of me and swims out to a buoy that it seems to like to stay near and I climb up the slope and head to my car. I am so thankful to have had such a successful trip because I know how easy the search for a rare bird can end in failure. I head off to Cape May State Park to finish off the morning with whatever else I can find. As if to say goodbye, the grebe waves its goofy foot in the air.